DROP EVERYTHING and READ BC 2014: IT'S OFFICIAL: BC SCHOOL LIBRARY DAY IS HERE! IT'S OFFICIAL: BC SCHOOL LIBRARY DAY IS HERE! 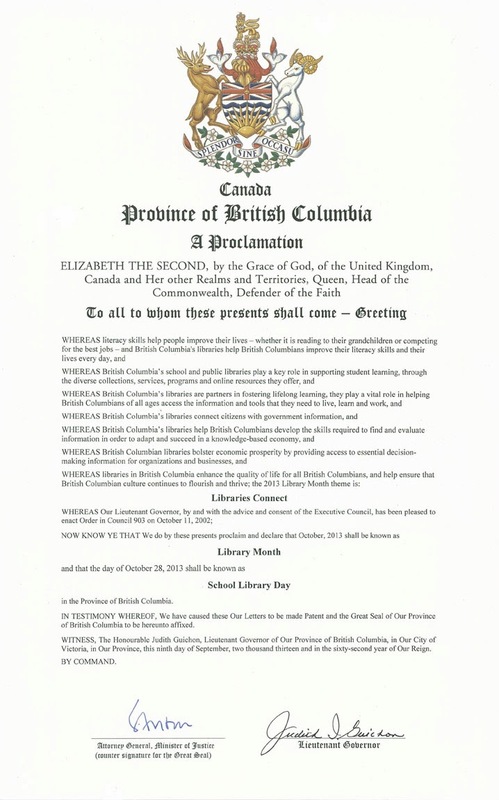 British Columbia, Lieutenant Governor, Judith Guichon, has declared Monday, October 28th to be BC School Library Day! She has also declared October to be BC Library Month, and in conjunction with DEaR, and National School Library Day, School Library Day now has its moment in the sun. Thanks to all teacher-librarians, the BCTLA, the Library and Literacy Branch of the Ministry of Education, and all those who support and advocate for school libraries in British Columiba!